June 20 will mark the 60th anniversary of the U.N. refugee agency, or UNHCR. Since 1951, UNHCR has been at the forefront of providing large-scale humanitarian assistance to people displaced from their homes and countries by war, conflict, and fear of persecution. In honor of this year’s World Refugee Day, the Darfur Dream Team Sister Schools Program is launching the Summer Service Challenge to create opportunities to learn more about refugees worldwide and in our local communities. According to a recent poll commissioned by the U.S. Association for UNHCR, “most Americans don’t know what a refugee is.” So we designed a Summer Service Challenge of activities and service projects for students, teachers, and community members to take part in. It will be a fun experience of learning, sharing, and taking action that raises awareness about the issues refugees face, particularly in our own communities. According to UNHCR, 43.4 million refugees and internally displaced persons are currently in need of life-saving assistance and protection, and most are in developing countries. With much of the necessary focus on protection and basic assistance, only two percent of all humanitarian aid goes to education. When NBA star Tracy McGrady and John Prendergast visited Darfuri refugee camps in eastern Chad in 2007, children and parents told them time and again that what they wanted most was education assistance in the camps. Since the creation of the Darfur Dream Team Sister Schools Program, we’ve been working to close this gap in aid and support the educational aspirations of the Darfuri refugees in eastern Chad. On average, a refugee will spend 17 years living in a camp. Education can serve as a protection tool and provide him or her with a better chance at a productive future. Half of the world’s 75 million out of school children are in fragile and conflict afflicted situations. Education creates an environment within these situations that provides a sense of normalcy and structure, reduces the risk of return to conflict and more importantly, produces hope for the future. More than 260 U.S. schools currently participate in the Sister Schools Program. The Darfur Dream Team Sisters School Program is honored that with the support of schools and donors throughout the United States and in partnership with USA for UNHCR as well as other core partners, we are able to improve the quality of and access to primary education for six schools currently in Djabal refugee camp and another six schools Goz Amer refugee camps in the coming year in eastern Chad. 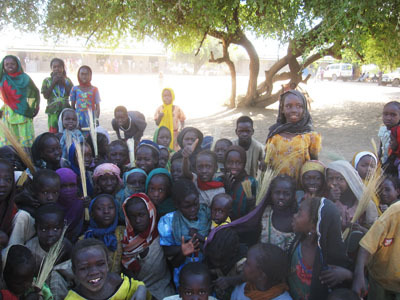 Join us for the Summer Service Challenge and visit darfurdreamteam.org to learn more about the Sister Schools Program.